Spring is in the air and Easter just around the corner: here at Cool Places we have an array of fabulous places to stay over the holidays, and even better, some amazing offers that make life a little easier on your wallet. Ranging from self-catering cottages to boutique hotels, there's something for families, couples and friends. Read on, then get booking. Join The Olde House for an Easter break and save 15% off one of their cottages for a 3-night stay on 19 April. They're located in a popular part of North Cornwall, it's the ideal place to spend the Easter weekend. Prices for a 3-night stay start at just £350. A country house hotel in Suffolk with a cool but relaxed boutique feel, Milsoms are offering two packages over the Easter weekend (stays between 19 Friday to 22 April) – one designed for families, the other for couples. Prices are £420 for a family of four and £155 per person for couples. And don't forget to mention Cool Places when booking. Their sister hotel, the Maison Talbooth in Essex, has got some great Easter offers too. 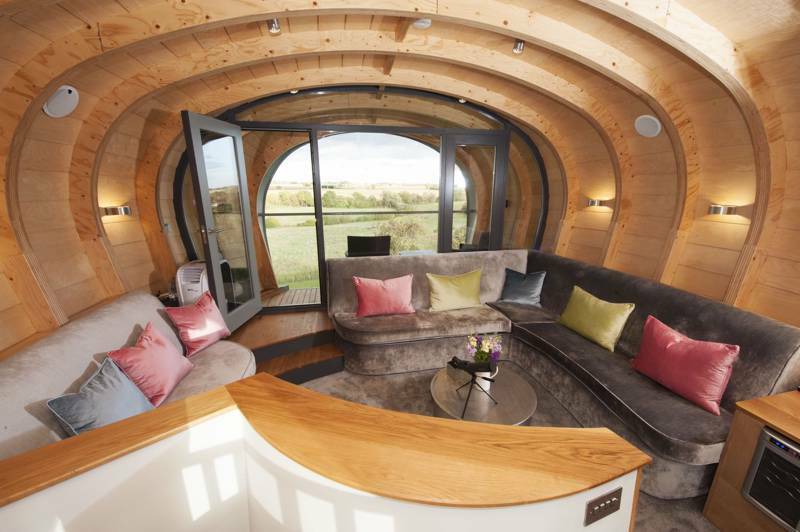 This wonderful converted windmill is the ultimate stargazing escape, and this Easter they're offering a welcome breakfast basket, complimentary bottle of wine and additional surprise treats to all guests who book to stay in April quoting Cool Places. Why not take advantage of the 'Special Two Night Spring Packages' at these award-winning safari lodges on the North Devon coast, and enjoy a relaxing soak in your own hot tub and a bottle of bubbly to get your stay off to a sparkling start – it's the perfect mini break. Prices for a 2-night stay start from £295 and the offer is valid 1 April–1 May. Looking for an Easter break with friends or family? Why not stay with our friends at Stable Cottage, a luxurious place in a prime location on the charming North Norfolk coast. Even better, save up to £500 on a 7-night stay. Owners Nick and Barbara Davies also let another cottage called The Brambles, a traditional flint building with a stylish interior and a well-kept garden (complete with hot tub) – the same discount applies there too. Save 20% when booking a break at Barford Beach House before 30 April: it's the ultimate luxury Cornwall holiday home by the sea and sleeps up to 16 guests in six en-suite bedrooms, with views of breaking surf and access to a secluded private beach at Wanson Mouth. What's more, the other properties in the collection –Tregulland Cottage & Barn and Pentire Penthouse – are offering the same deal. These high end lodges with hot tubs in a stunning North Cornwall seaside location are offering Cool Places readers the chance to enjoy a £40 voucher upon arrival for either cycle hire at Elm Farm on the coast to coast cycle trail, or a £40 voucher for a family pizza at the Cornish Pizza Company in St Agnes. To book, use code CYCLE or PIZZA, and don't forget to mention Cool Places. Escape to Cornwall this Easter and stay at this chic B&B where guests save 15% for stays of 2 nights or more from 19 April 19 - 2 May. It has four de-luxe, boutique guest rooms with sea views, floor-to-ceiling windows and uniquely decorated bathrooms. Celebrate Easter at The Fox at Willian and enjoy 2 nights for the price of 1 over the holidays (8 April - 22 April). Situated in the pretty Hertfordshire village of Willian, The Fox is a revamped pub that does everything a country inn should do: it has a set of very comfy guest rooms, recently decorated in crisp contemporary style, serves excellent food that's very moderately priced, and is a cosy place to pop into for a pint too. This lovely spot provides a warm welcome and fabulous views in what is one of the best places to stay in Pembrokeshire. At the moment, guests can save 50% off their second night or stay 3 nights for the price of 2. The B&B is super child-friendly, with rooms that can accommodate families of up to 5. When booking, quote Cool Places.